Free Shipping Included! 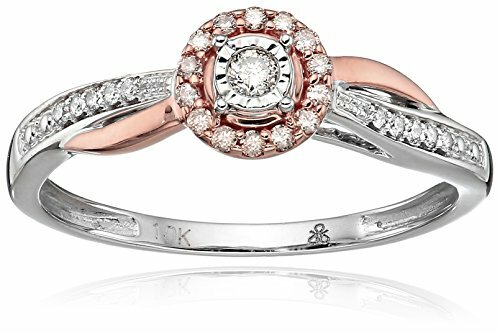 10k White And Rose Gold Round-Cut Diamond Promise Ring, Size 6 by Amazon Collection at The Bling Tree. MPN: RP-1692-Size 6. Hurry! Limited time offer. Offer valid only while supplies last. The diamonds in this ring are guaranteed to be "conflict-free". We proudly adhere to the Rio Tinto "Chain of Custody" program, which includes comprehensive audits of the supply chain to ensure the diamonds are traceable to the source. Imported. Carat Weight Listed is Total Diamond Weight. The natural properties and composition of mined diamonds define the unique beauty of each piece. The image may show slight differences to the actual stone in color and texture. All of our diamond suppliers confirm that they comply with the Kimberley Process to ensure that the diamonds that they supply are conflict free.